I always wondered how the devil's disciple, aka Trump, managed to worm his way into the good graces of a religious congregation. On one hand, I recognize the appeal of someone in power who is against abortion, but where does the allegiance stop when everything about Trump is corrupt? One mystery about how he got such immediate backing from evangelicals has been solved. It turns out that days after Trump was elected he told the Pentagon to buy nearly $900,000 in jet fuel from the conservative university owned by Jerry Falwell Jr., who by the way, endorsed him for president. If that seems odd, there's good reason why. The Pentagon has never been told to buy jet fuel from any private organization before. Ever. 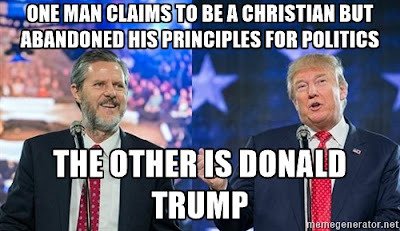 The kicker here is Falwell was the first big evangelical leader to come out and support Trump during the election, and it's obvious he was rewarded for his efforts. 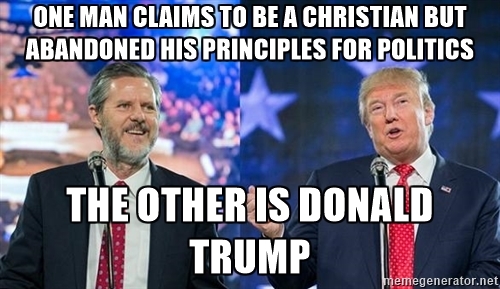 Using Falwell as his springboard gave Trump legitimacy he didn't deserve. He still enjoys that backing in spite of all the hateful things he's done to divide our country. This information won't make you rest easier, but at least it goes towards explaining how someone as corrupt as Trump co-opted religion to build his cult base.